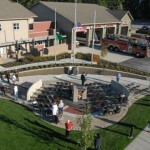 This local fire station was awarded a piece of steel from the World Trade Center in 2011. 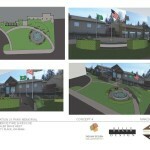 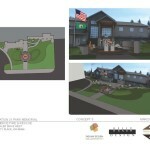 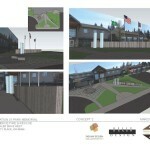 In order to properly display, share and honor this meaningful artifact the fire station engaged local architects, designers, artist and contractors to design and build Reflection Park. 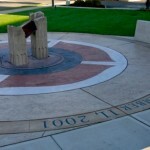 The park is meant to be inviting to the public to educate children in the community, to honor the fallen fighter fighters and to remember all that perished in the tragedy on September 11, 2001. 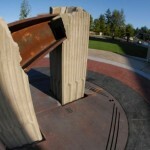 The piece of steel from the World Trade Center is prominently displayed on a double column pedestal created by a concrete artist that was inspired by the World Trade Center Towers at the center of a circular paved area, which reads “Never Forget”. 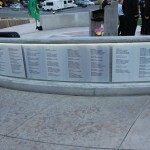 Behind the half walls that surround the paved area are the names of the fallen fire fighters. 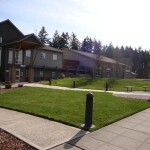 The wall/fountain that follows the path to the building entry includes vertical score lines for each that perished on September 1, 2001. 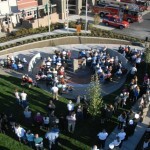 The Park was dedicated and open to the public on September 11, 2012. 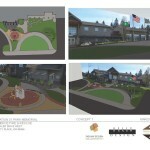 I developed initial conceptual layouts and presentation documents.